Here’s a recipe for a cheap and easy way to make a quick buck in Hollywood. Take one screenplay from a classic action movie from the 80s, change the nationality of the main villain to whatever nationality is easy to antagonize at the time. Set it at the White House and add actors that are respected by audiences, but are not too expensive to hire. Stuff it full of patriotic imagery and then release at a time where the only competition is an animated family film from Dreamworks. Voila, Olympus Has Fallen. 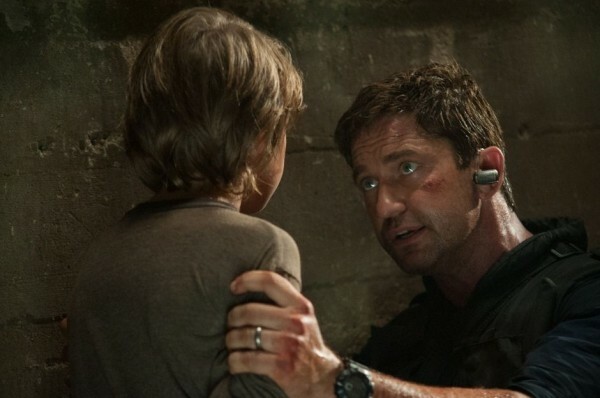 The film stars Gerard Butler as Mike Banning, a disgraced Secret Service agent who served on the security detail for President Asher, played by Aaron Eckhart. One day, a terrorist organization led by Kang, played by Rick Yune, storm the White House, kidnap the president along with his various chiefs of staff and hold them hostage in an underground presidential bunker. Banning is the only agent inside the White House after the initial assault who can save the hostages, under the command of the speaker of the house, played by Morgan Freeman. As you can see, the plot is very familiar territory for anybody who has seen an action film made in recent history. Combine that with the clichés that come with any movie set in Washington, D.C. or involving the President somehow, and you have yourself some genuine government cheese. It has some decent cinematography, but the suspension of disbelief is very easily broken by the fake looking CGI used to show the damage to the White House and the various monuments, as well as few Emmerich-inspired disaster scenes. It’s not as bad as Birdemic, but it’s bad enough to almost take you out of the movie. The overall style makes the film come across as a two-hour TV movie than a theatrical release. While it may sound like I absolutely hated the film, I still found it to be entertaining in the same way one would find enjoyment in watching any 80s action film. This is your typical Die Hard set in the White House with Gerard Butler replacing Bruce Willis. If you’re into that kind of entertainment, you’ll enjoy it, but wait until it gets to the dollar theaters.